Tile should be fun, unique and inspiring. Especially Onyx tile as it can be breath takingf and one of the most beautiful tiles of all. Tile when done right can be a true art! To Brunetti Tile installing tile in Colorado is fun and we love what we do. Shall a customer just need a large SF area of floor tiles laid down as quickly (but professionally) as possible, well we can do that too! We do not sub out our clients work. We meet with our customers, we provide the estimate with a detailed take-off list if needed, and WE show up to do the work. 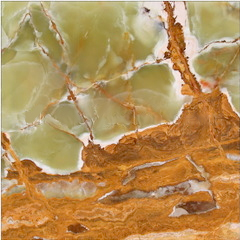 Onyx tile is a natural stone similar to marble. Onyx tile has wavy lines and veining like marble and slate tile is porous as well, like travertine, which means it can be used only in limitations or needs some extra work to seal it. Onyx tile's grained appearance makes it one of the prettiest kinds of tiles, but again it also requires extra work. Brunetti Tile always recommends using a tile saw, but if one did try to cut onyx as you would ceramic by scoring and snapping, it's probably going to make up its own decision on how it will brake. Onyx tile is as it would appear - demanding attention! Not only after its installed as it can be truly stunning, but in installation as well. 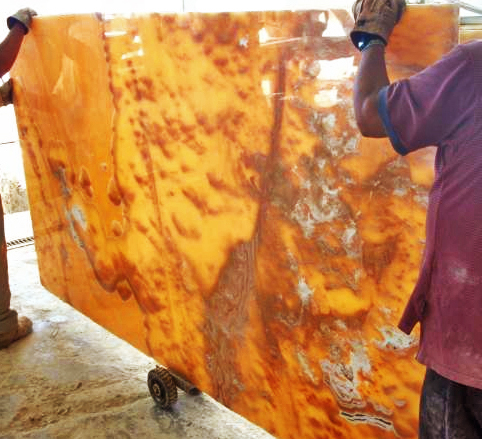 Extreme care needs to be taken, much like when handling large slabs of granite.